Yesterday's journaling went . . .okay. I definitely want to begin to try my hand at "art journaling", but I do love to write. As such, much of what I want to express comes out better in words than it does visually. Or something like that. . .see. . . me write good. Yeah, we'll see how that goes. In the meantime, let me share what else I'm up to. 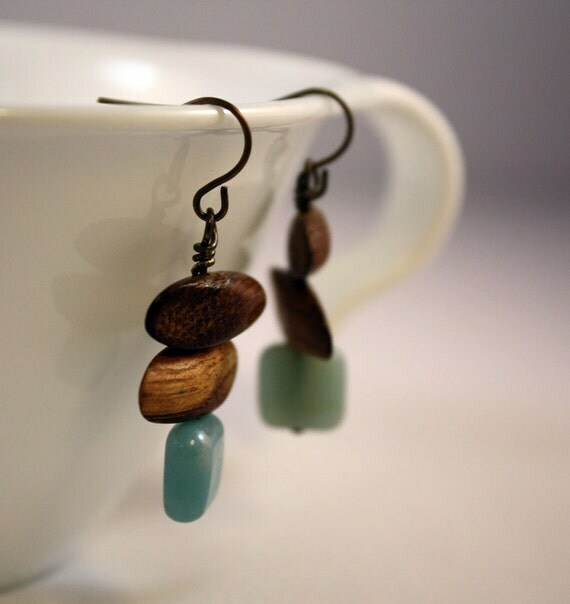 Laurel Steven at Rue's Daftique is having a 40% off Rent Party Sale in her Laurel Steven Etsy Shop.. Apparently, she has already sold enough to pay her rent, but the sale is still going on if you want to check it out. 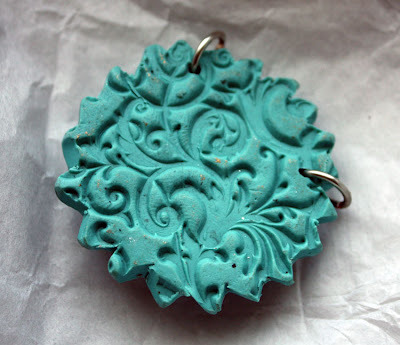 I swooped in and got this GORGEOUS pendant that came in the mail yesterday. She even textured the back side of it with swirls. Now to come up with a design that will compliment it's awesomeness! In addition to the pendant, I received more happy mail yesterday. A friend (I haven't seen in about 14 years) and I have been re-connecting via Facebook for a few months. She's in to arts and crafts too and wanted to do a swap between us. Apparently, she had just ordered some mini dominoes. She sent me 12 of them. We agreed that these can be made into anything (though she has a request or two), but we MUST use at least six of them and will send the completed projects back to each other at the end of September. I just need to figure out what to do with them. 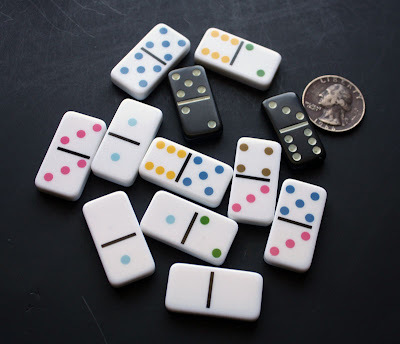 There are no holes or anything, simply mini dominoes. Suggestions?! Ideas!? I'm open. I'll also be playing with Sarah at Saturday Sequins as she has offered up a sequin challenge. She's calling it Sequintastic September (since the challenge is to create something with sequins and reveal it as part of a blog hop in September.You probably figured that out yourself though huh?) Anyway, it sounds fun right!? 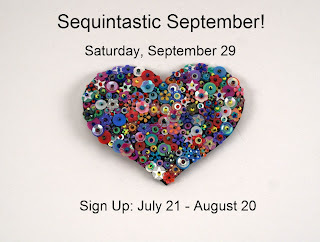 Well, head over to Saturday Sequins now to sign up!! Cat Kerr at In the Light of the Moon has been playing around with new materials also. In fact, she made some really beautiful polymer clay pendants that she wants to give away. You should totally check it out!! 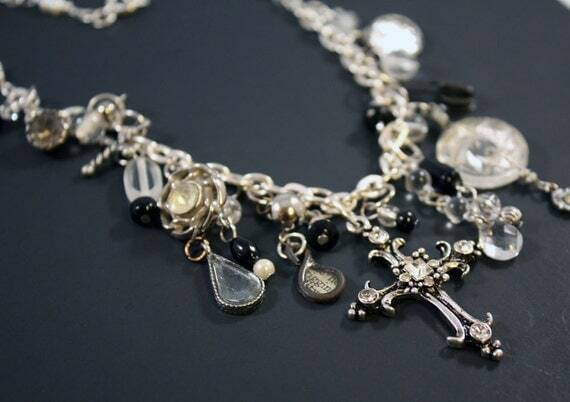 Suor Angelica JUNK Necklace on sale! It sounds like I've got a lot on my plate and better get busy with it! What's on your plate at the moment? 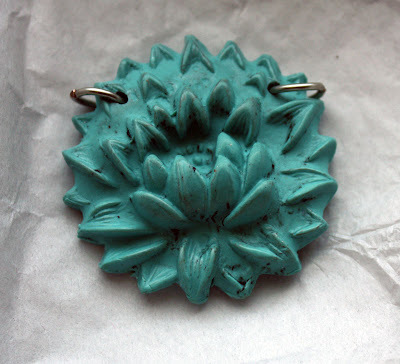 That pendant is gorgeous! I also love the idea of the swap you are doing with your friend- can't wait to see what you create with those dominoes!